Earlier this year, Twitter erupted with memes, criticism and laughter at Alessandra Malito’s piece in MarketWatch. In the article, Malito voiced support for an idea set forth by Fidelity Investments, stating that the average American should have twice your salary saved by age 35. While many – especially millennials – may scoff at that mindset, Malito states the harsh truth of skyrocketing costs of things important to many in that age bracket. For those house-hunting, home prices and mortgage rates are steadily rising. While some may choose an apartment, condo or their parent’s pad, many others may also be looking to tie the knot around this time in their life. The average American wedding costs around $35,000. That figure takes into account costs for things like the rings, dress and catering, but the honeymoon is a whole separate animal. Probably the most frustrating and prevalent financial burden for millennials is student loans. While the figure can vary widely based on school and major choice, student debt hit a record $1.31 trillion this year. While clever memes suggested having a royal wedding or collecting all of the infinity stones was more achievable before saving two years of income by 35, a proper plan can help put that in motion. While nobody’s life works out perfectly like an investment calculator, taking these six steps now can help make Malito’s plea a reality – and every millennial’s life that much easier. Pushing off the start of investing by even a few weeks or months can result in thousands and thousands of missed dollars in the future. 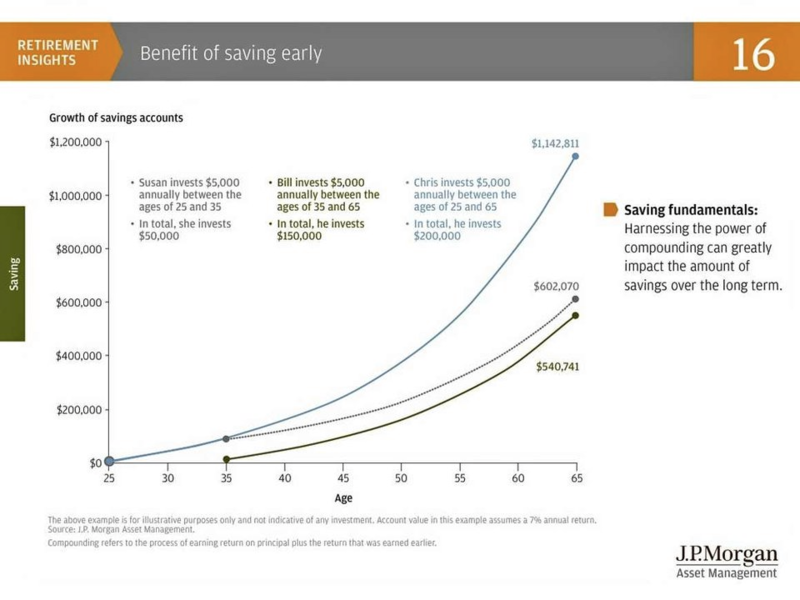 Remember in middle school when your math teacher lauded compound interest, showing a curved chart on the wall with a now-antique overhead projector, showcasing the benefits of starting the saving early? 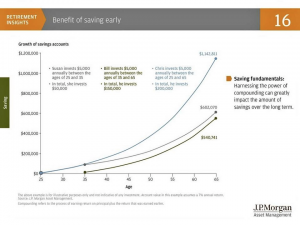 This chart from J.P. Morgan Funds showcases three different people. Although, Susan invests for only a single decade she has significantly more cash than Chris who did the same for four decades. The start is what matters. Bill is the ideal one to follow in the chart, starting early and maintaining his pace. Compound interest is an incredibly powerful tool to have in a financial arsenal. 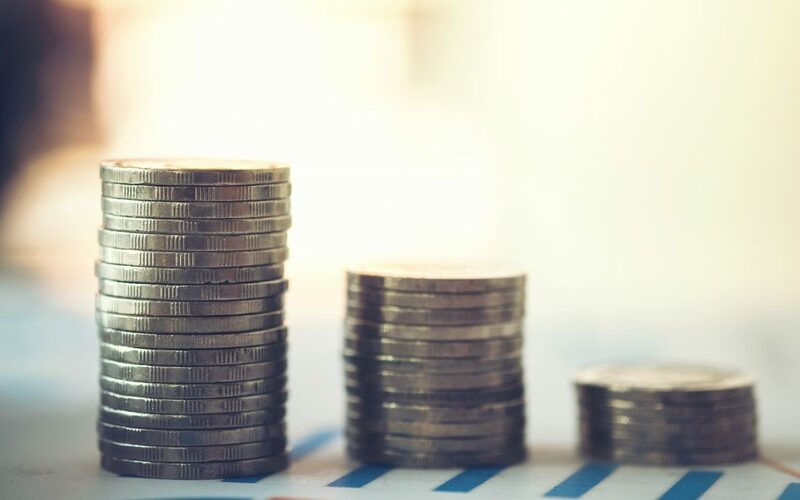 When the interest accrues on both the initial investment (principal) and also on the accumulating interest, the money multiplies, multiplies, multiplies and multiplies some more. Another example showcases the key between simply saving and choosing to invest. If you took $1,000 and place it under your mattress every year for two decades, you’d end up with $20,000. Easy math, and a nice sum. However, if you took that same cash and put in a basic account with a 7 percent annual return, in that same span you would have $47,734.86, more than twice what you were sleeping on! Even a safer investment with only 5% of an annual return – something easily found with a variety of account options – is showcased with a simple $5,000 investment. In a single span of 10 years the amount would raise to $8,235. That’s a “free” $3,235 that was earned by simply putting aside $5,000 and letting the money do the work. The fun and fantastic power of harnessing compound interest can be toyed with here. This second tip goes hand-in-hand with the first and shares equal importance. Just like compound interest can be your best friend in terms of investments, it can become your worst enemy with ballooning debts. Many millennials own at least one credit card, using it as a safety net and sometimes more. Impulse buys, trips and late-night, last resort pizza orders seem miniscule and fine, especially when the credit card kicks the cost down the road for a future self to fret about. However, say you are carrying a balance of $500 on two cards each. Say the interest rate is ‘only’ 18 percent, a bargain given many cards can charge up to double that on new card owners. If you were to only pay the minimum each month, you’d fork over nearly $2,900 over the course of 19 years. If left unchecked, the interest owed on debts – including those mammoth student loans – can unfortunately counterbalance any positive interest made through investments. A good way to go about it is to pay the minimum amount on your lowest-interest cards first while putting as much as possible on the cards with higher interest. If possible, always make the maximum payment to deter interest and clear them out. One characteristic that millennials seem to own proudly is believing to know everything and refusing to consult others for aid. Believing that ‘I’ll be fine’ and relying on a simple Google search or even something like this article is not enough to create a game plan. If you’re planning a day trip to a new place with your significant other, you wouldn’t rely on guessing on the turns or hoping to catch all the road signs along the way. You’d fire up your phone’s GPS and let it plot out the best course of action. Furthermore, today’s smartphones can account for variables like construction, accidents and traffic patterns, offering several options with a corresponding timeline. Consulting a financial advisor is the same idea. By creating a plan for your future, an advisor can help you reach your desired financial destination while accounting for bumps in the road which will certainly pop up. Having a financial plan does not only list ‘hot’ stocks to pick, rather it can create a diversified portfolio proven to grow with the market. Additionally, options like a Roth IRA or employer-backed 401(k) are one of the many avenues to put your money. Also, having things taken care of like life insurance can help create a peace of mind for not just yourself, but anyone riding along in your life. Being young allows for an opportunity older investors are not privy to. While we already covered why it is better to invest as early as possible, it can also help to roll with punches. Yes, the market can take a turn, and so can life. Sure, it is great to invest $500 or $1,000 a month if possible, but what about a friend’s destination wedding? A totaled vehicle? A set of twins? Life can offer up curveballs, so investing early and often when possible can help to cover for times when that money needs to go elsewhere. Furthermore, it is important to stay away from listening to the noise of uncertainly. Everyone knows the market took a tumble in 2008. Many chose to sell off, getting literal pennies on the dollar of their earlier investments. However, those who stayed true did more than weather the storm. The S&P 500 lost roughly half of its value in 2008, but today it is now 80% higher than it was at its 2007 peak. You work hard for your money. As explained before, you should have your cash doing the same for you. Many millennials today have a No. 1 job coupled with several side hustles. Things like driving Uber, flipping sneakers online, tutoring or creating paintings on Etsy are fun ways to build up cash for the weekend bar tab, but it can also be considered decent change for an eventual nest egg. While some may think a simple savings account is a smart, default way to collect money, it doesn’t do much for you in the long term. An emergency fund is essential and having disposable spending money should be there, but a savings account brings a minimal return. Most banks offer a measly 0.01 to 0.06% in these options. Say you put $100 a month in a savings account. After a decade, you’d have $22,095.92. That sounds great, but you contributed a whopping $22,000 of that own your own. The bank happily kept your money, giving you less than $100 for your ten years of loyalty. Check your job, see if your workplace offers to match contributions to a 401(k). From start-ups to established companies, many are offering this perk more and more. It is literally free money! Generally, an employer will match you up to 6 percent of your gross pay. If you made $50,000 and chose to invest $3,000 over the course of the year in the 401(k) your employer would add another $3,000. That’s a great return on investment right away. Popular apps like Stash, Acorn and Robinhood offer users the chance to take money and buy stocks without the need for a broker. It can be a fun and interesting way to learn how the market works while also choosing to possibly skip a latte once in a while for a chance to own an actual share of Starbucks. However, it is still crucial to have help on your side. Choosing a financial planner to help guide you through different options can help you to make educated decisions, something you should always consider when dealing with your own money. One of your parent’s favorite words growing up, having a budget may sound old-fashioned or boring. However, expenses only add up as you get older. Part of a long-term financial plan should be the willingness to sit down and truly consider where and when you’re spending your money. This isn’t to say that a date night dinner or splurging on a nice watch or heels should be avoided at all costs – but that cost should be accounted for. Limiting the number of times you eat out as opposed to cooking at home, driving instead of using an Uber, choosing a decent label instead of a high-end brand, these choices can add up quickly. When coupled with investing, saving money can offer new financial horizons. Yes, you’re young and have the opportunity to overcome hiccups in the market and life itself and a chance to reap the literal rewards later on, but focusing on your spending habits today can also make a big difference down the road. Challenge yourself to go a day or entire week without getting that drive-thru coffee or restaurant lunch. Putting a mini streak together of savings can feel quite good. Perhaps reward yourself with a splurge, maybe making a bigger purchase like a nicer TV, getaway trip or rare shoes after you go an entire month without that frappe or sub sandwich at lunch. While it is not necessary, you’ll feel better about yourself and your bank account will reflect that happiness.